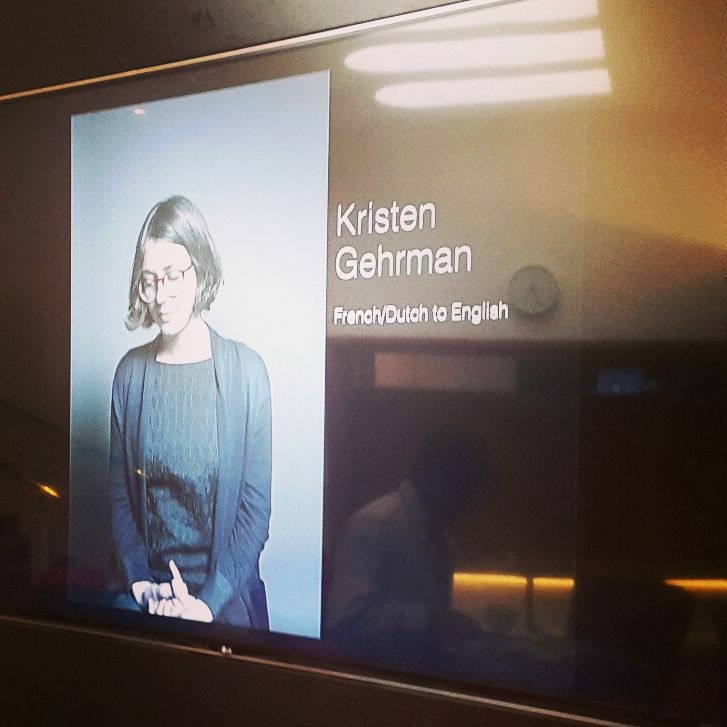 This photo is what got me to the Translator Made Corporeal event at the British Library in London in the first place. 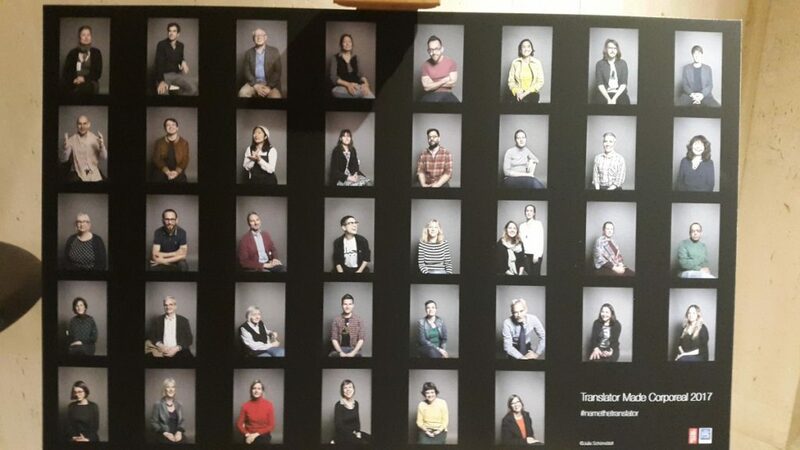 It was taken at the London Book Fair by photographer Julia Schoenstaedt as part of a portrait series revealing the rarely-seen faces behind literary translation. The project set the tone for the event, which aimed to investigate the “human, flesh-and-blood translator in a historical and cultural context.” As keynote speaker Jeremy Munday put it, a translator leaves a “linguistic footprint” that is inherently biased toward his or her world view. The translator’s notes scribbled in the margins and correspondence with witers and editors allow us to “taste and smell the literary creation process”. Some of these notes are preserved in dusty archives, like at the Harry Ransom Center (in Texas of all places) and of course, at my favorite spot in London, The British Library. But one of the main shortcomings of translation archives is their lack of representation. With the limited funds they do have, these archives tend to preserve only work that’s “worth preserving”, and work that’s “worth preserving” is generally written by a narrow sliver of the intellectual elite. Studying writers’ lives, living room literary circles, secret editor-translator love affairs, tight-knit political protest groups…there’s a word for it: “micro-history”. As far as I could tell, “micro-history methodologies” are all the rage. As one scholar explained, examining small cultural communities through a micro-historical lens is the only way to truly place the translator at the center of the study. Granted, sometimes it can be hard to find traces of the translator in the translated work, but by investigating his/her micro-history, one can focus on the personal ticks, political feuds, cultural trends, social limitations, moral censorship – the entire climate in which he, or oftentimes she, worked. Well, they’re probably all at their desks making the men sound good. Women, both past and present, have often carried out the bulk of literary translation work. Sometimes under pseudonyms, sometimes as wives of famous writers, sometimes without ever being mentioned at all, they are responsible for bringing us great works of literature in our own language. Take Tolstoy’s English translator, Constance Garnett, for example, a nineteenth-century Russian scholar who was once accused of translating Tolstoy’s work from the “easier” language of French and called “demure” by her critics. Women translators remain largely absent from both archives and research. In the endnote discussion, an audience member (yes, I have to out him as male) asked with a hint of exasperation: “Why do we as translators feel the need to justify our profession?” In my opinion, for the same reasons that care workers, teachers and mothers are constantly having to justify theirs: it’s a highly skilled profession dominated by women – women quietly kept hidden in service to men. In the endnote discussion, someone mentioned that translation scholars have a tendency to slip into “anecdote”; they get so caught up in their micro-histories that they miss the big picture. Why does historical translation research even matter? Why study it at all? As one researcher pointed out in his presentation on interpreting for the deaf in nineteenth-century Irish criminal courts (which, I might add, was entirely presented in sign language! ), translation is a way of giving a voice to the voiceless, and in the case of his research, critical to guaranteeing a fair trial. Another scholar focused on Ada Prospero Gobetti’s translations of foreign literature in Fascist Italy, suggesting that of all her political activities, these translations may have been the most radical and revolutionary of all. The political nature of literary translation was also discussed at a London Book Fair panel on translating writers at risk (read my post about it here). Oftentimes, writers of tremendous cultural and political importance are hardly known until they’re translated, which, in my opinion, makes their translators as culturally and politically important as they are. Far from simply converting language A to language B, translators are expected to be editors, cultural navigators, expert ego managers, and nearly clairvoyant interpreters of intent (with a super-human power to read between the lines). Apparently, this is nothing new. I learned that the dragomans to the Western colonialists served as translators, interpreters, servants, travel agents and everything in between, for very little pay. Scholars of Arabic, Turkish, Persian, French, German and English, they were often expected to interpret at embassy meetings and then clean chamber pots. They were both sought after for their education and mistrusted for their intelligence. One historian got her hands on a turn-of-the-century scrapbook of a “highly reputable” dragoman, which offers a fascinating glimpse into the personal life of a brilliant man with an invisible profession. Afraid to eat our humble pie? Translators tend to downplay what they do. This was one researcher’s conclusion following her investigation of the “Who Am I” profiles on the Emerging Translator’s Network. I found her observations interesting. I’ve also noticed that when translator’s present their work online, they either go for the “the humble brag”, i.e. presenting their accomplishments modestly and sometimes in a self-deprecating way, or “the shameless plug”, promoting their work with the “shameless” disclaimer attached (as if there is something to be ashamed of). Is this so-called modesty a common personality trait among translators or is it the fault of a quietly competitive field where staying out of the limelight is practically in the job description? Does this mean we’re rich? There’s financial capital and there’s literary capital. Most translators can attest to the fact that the two don’t necessarily go hand in hand. Having literary capital starts with studying at a university, learning how to drop a literary term here and there, and having read (or at least know how to appear to have read) fat books by dead writers. But it goes beyond that. Translators whose work has stood the test of time tend to have high literary capital in the sense that they run in literary circles, have relationships with publishers and editors and have built up a solid reputation through good breeding and connections. So who are these literary translators who achieve “celebrity” status? Well most of them are people with high literary capital. Of course, this raises the question of diversity – and like most intellectual fields, minorities remain underrepresented. 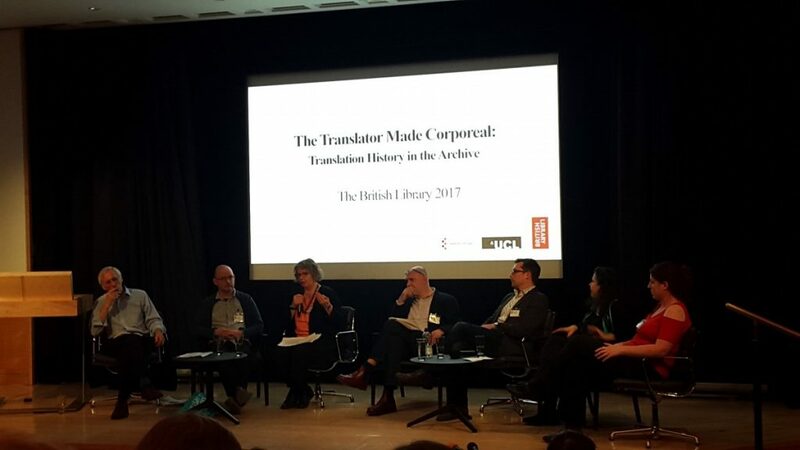 In short, it was a wonderful one-day event at the British Library and fantastic opportunity to interact with the more academic side of translation. Of course it’s easy for me to say coming from Amsterdam, but if you are considering travelling to London for an event at the British Library, just do it! You will be glad you did!